You wish to subject your open file to an EditScor procedure that you want to invoke through a simple command as a plugin. 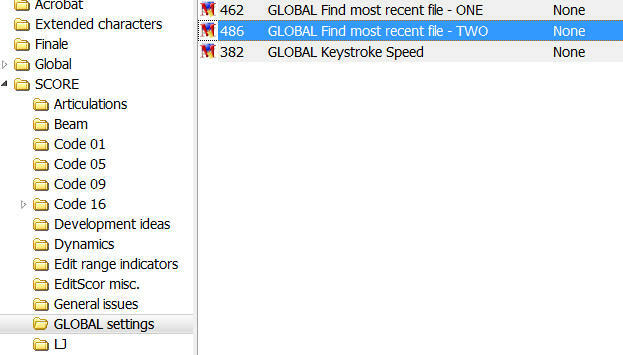 You invoke the plugin; “GLOBAL Find most recent file – ONE” first types “sm” into Score in order to create a new time stamp. This allows the plugin to find out which file to process by looking for the file with the most recent time stamp within the current directory. EditScor, executing your script, is invoked in the background, processing the file identified in step (2). The EditScor script is elaborate, resulting in 12,867 changes. As soon as EditScor is finished, it exits and commences writing the revised output file. The plugin attempts to read the revised file (with the same nomenclature as the open file) into Score, but the write-to-disk procedure initiated by EditScor may not yet have completed due to the extensive revisions. As a result, the plugin would read the unrevised file back into Score, and no changes would be visible. “GLOBAL Find most recent file – TWO” attempts to avoid this potential problem by creating yet another time stamp (assigned to a variable) to which the time stamp of the revised file will be compared until it is equal to or greater that the time stamp assigned internally to the variable just created. The plugin resumes, reading in the revised file.